Robert F. Black, Jr. has earned recognition as one of New Jersey's top attorneys by "exemplifying superior qualifications, trial results, and leadership." Through compassion and zealous advocacy, he is deeply committed to seeking justice for his clients. Passionately committed to equal justice for everyone. The justice system is the most powerful instrument for change in our society. We proudly serve our clients with this principle in mind. Utilizing a thorough understanding of the law, cutting edge legal research methods, keen legal analysis and savvy people skills to provide unparalleled representation. When you are faced with a pending legal matter, it is vital that you choose award winning counsel with the skills and savvy to stay ahead of the curve when it comes to protecting your freedom, reputation and interests. When matters arise that require you to hire a criminal defense attorney in Monmouth County, New Jersey, it is paramount that you choose someone who is prepared to provide large-firm excellence, small-firm attentiveness, and cost-conscious representation from the very beginning. You need someone who can put you at ease and treat you with compassion and care outside of the court room, yet is able, ready and eager to strongly, wisely and passionately advocate for your interests like they were his own. When facing a judge, jury or prosecutor, Robert F. Black, Jr. can be your best friend. Criminal defense attorney Rob and his staff stand ready in Monmouth County to FIGHT FOR YOU! Most importantly, he is eager to WIN FOR YOU! If you need a litigator who has your back in the Central Jersey area, including Monmouth County, Middlesex County, Ocean County and Somerset County, CALL TODAY. Rob and his staff have successfully represented thousands of clients yet are committed to treating each and every case with maximum skill and attention. Our goal is to win for you. Plain and simple, your interests are our interests. At our firm, we are proud legal pioneers who use the latest research methods along with in-depth analysis and keen intuition. With these tools in mind, we strive to provide the highest quality legal representation at reasonable rates. AWARD WINNING REPRESENTATION. COMMITTED TO EXCELLENCE. At The Law Offices of Robert F. Black, Jr. in Monmouth County, we are eager to use our success to protect you, your freedom and your financial interests. We understand choosing a criminal defense attorney is a serious decision. The legal profession encompasses many areas of expertise. The Law Offices of Robert F. Black, Jr. only commits to help clients when we feel confident our representation will help them achieve the best possible outcome. Initial consultations are always free of charge. No matter what issue you are facing, if we are unable to handle your matter we can help direct you to someone who is. Looking for honest feedback from experienced and knowledgeable professionals in a compassionate environment? Call us today. At The Law Offices of Robert F. Black, Jr., our goal is to WIN FOR YOU! Our law firm is pleased to serve the following localities: Monmouth County, Asbury Park, Freehold, Long Branch, Middletown, Neptune, Ocean Township, Red Bank, Belmar, Brielle, Hazlet, Highlands, Holmdel, Howell, Marlboro Township, Matawan, Oceanport, Shrewsbury, Essex County, Newark, Hudson County, Hoboken, Jersey City, Mercer County, Trenton, Middlesex County, Perth Amboy, and Plainsboro Township. We also associate with skilled advocates in New York. Have you or a loved one been arrested? Do you currently face criminal charges in Monmouth County and need a defense attorney? You don’t need an attorney to tell you that your freedom, reputation and hard earned money is under attack. At The Law Offices of Robert F. Black, Jr., we know how difficult and stressful this time can be. Inaccurate police reports, inflated charges and combative prosecutors have you facing an uphill battle. You don’t have to fight this battle by yourself. We are prepared to take every step required to ensure your rights are protected. We present your version of the facts. “My job is to ensure that the police officer will not be the only voice heard.” -RFB. 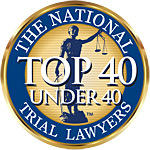 Robert F. Black, Jr. was named by The National Trial Lawyers® as one of the TOP 40 attorneys in New Jersey under the age of 40. He is friendly and affordable but will never compromise your rights. Mr. Black prides himself as a highly skilled lawyer who aggressively and passionately represents each and every client like they are family. At our firm, our goal is to WIN FOR YOU! We know people make mistakes. Let us make sure you are not defined by the difficult situation you are dealing with. Allow us to help you emerge victorious and build a better future for yourself and your loved ones in the process. Were you recently arrested for driving under the influence of drugs or alcohol in the state of New Jersey? It is a serious situation that requires a serious attorney. Your financial security can be shaken by costly fines and insurance surcharges. Your freedom is being threatened by the prospect of a mandatory driver’s license suspension and potential jail time. It is crucial to hire a Monmouth County criminal defense attorney who is prepared to FIGHT for you rather than just accompany you to Court as you plead guilty. Charged with a DWI in New Jersey? CALL US 24/7 AT (732) 333-0921.